I decided to go to Aitutaki with my wife for our anniversary. The plan was for me to fish in the mornings while she studied for her real estate exam, then hang out together from lunch time on. Air New Zealand recently established a direct flight from LAX to Rarotonga, which is the capital of the Cook Islands. From there you can take one of several daily flights to Aitutaki. Unlike Rarotonga, Aitutaki has a huge lagoon in the center of it which is always calm and home to lots of fish. I figured if the wind was too strong to go outside the reef I could always find something to cast at in the lagoon. I chartered four mornings with Captain Mike on his boat Black Pearl and one morning with Itu Davey in the lagoon. Like the few other charter captains there, Mike mostly just takes tourists right outside the reef to troll for small tuna and mahi mahi for dinner. 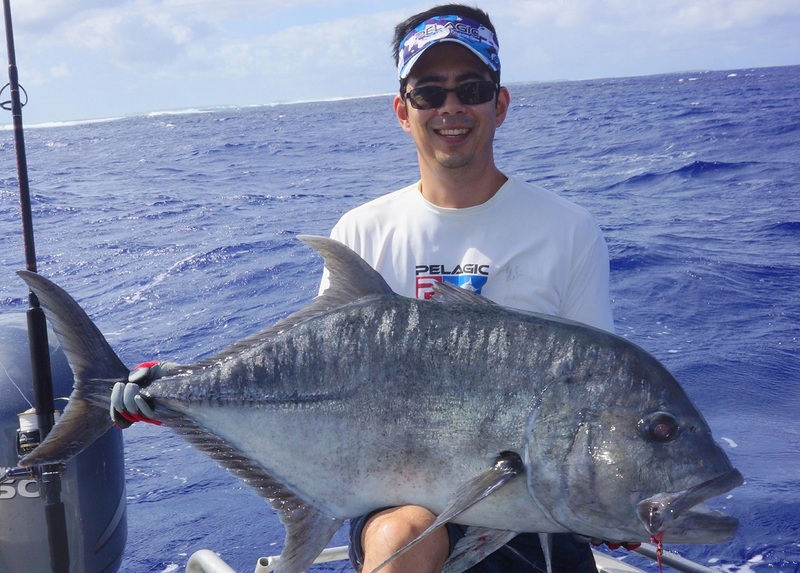 I had no interest in that; I wanted to throw big poppers for Giant Trevally. Although Mike rarely takes people out for that (he said I was the third person who had ever asked him to focus on GTs), he is a big spear fisherman so he knew some good GT spots. I also told him I wanted to try for a Maori Wrasse. He said he had never caught one on rod and reel but had seens some when spear fishing and knew some spots we could try. Landed in Aitutaki in the morning and basically just rested and hung out until around 5pm when I decided to go work the shore with jerkbaits and plastics. Landed a few small grouper and got plenty of small trevally bites. Then out of nowhere a 20lb Bluefin Trevally chases the lure all the way to my feet and grabs it but doesn't hook up. It swam around looking hungry so I cast my lure out again. Man, was that a mistake. The fish grabbed the lure and ZZZZZZZZZZ immediately made all 170 yards of 30lb braid on my light spinning reel disappear. Spooled. Went back to go get something to eat and think about that fact that I should have packed extra line. This was my first day out with Captain Mike. It was pretty windy but Mike's boat the Black Pearl was very seaworthy and Mike declared it safe to go outside. It was pretty bumpy (Mike's friend who came along to act as deckhand got seasick) but it was fishable. 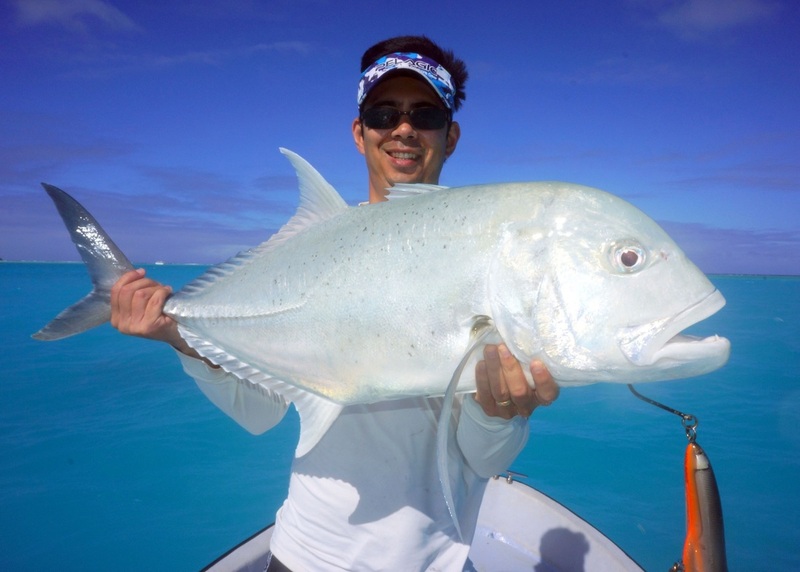 Mike positioned the boat as close to the reef as it was safe to do and I started casting big poppers into the white water and ripping them back. It was a lot of work but right off the bat I got a big strike and landed a GT a little over 20lbs so that fired me up. Mike did not look at where I was casting; he was focused on the waves coming in which was very reassuring from a safety standpoint. When I got a hookup I would yell out and he would gun the boat away from the reef so that we could drag the fish into deeper water where it couldn't get in the rocks. That worked pretty well throughout the morning. I hooked 6 GTs and landed 4 of them, the biggest being in the 55-60lb range or so. Those things really pull on a locked down drag. I also hooked an enormous barracuda that gave one nice jump before biting through the assist hook cord. Awesome way to start the trip. Out with Mike again; the wind was still up and the conditions were still "sporty" but better than the previous day. I went 4 for 7 on the GTs although the average size was a bit smaller than the previous day. Lost some nice ones in the rocks but with this kind of fishing where you cast right on the reef there is no way to land every fish. Interestingly there was no bycatch on the poppers other than the one barracuda the first day; in other places you normally get the odd snapper or grouper or other reef fish but here the only thing that bit the poppers was the GTs which was fine with me. In the afternoon I went out with my remaining light tackle outfit and absolutely slayed the small groupers and snappers on soft plastics near my hotel. I also caught a queenfish which we had for dinner. 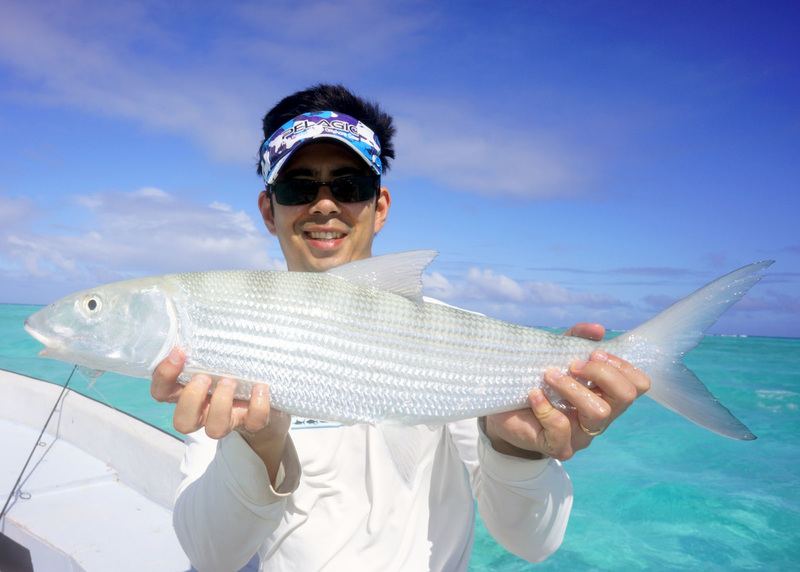 On this day I went with guide Itu Davey for bonefish inside the lagoon. Itu is the man when it comes to bonefish. It was extremely windy this day (good thing I didn't try to go outside) which made fishing a little challenging since the boat drifted fast. I retrieved some small soft plastics on the bottom and suddenly my rod doubled over and my line went whizzing out at an alarming rate. Itu said "bonefish" in a rather calm voice and a second or two after he said it I was spooled again. Twice in one trip. This was a 2500 size spinning reel with 30lb braid and it got emptied so fast it was ridiculous. I gained a newfound respect for bonefish; I have never seen anything zip so much line off so fast. The bonefish in Aitutaki are very large; much larger than anywhere in the Caribbean. After that it was slow for a while so we switched spots. A small pod of GTs swam in front of the boat and so I grabbed my heavy popping outfit which I had brought along for this eventuality and landed the popper about 20 feet in front of the lead fish. One pop and BOOM - he smacked it and took off. Fortunately with the sand bottom he had nowhere to wrap me up so I landed him - nice 30lb GT. The ones in the lagoon are very light colored, as opposed to the ones outside. That made me feel better about getting spooled. We then tried another spot for bones and something grabbed my 2-inch plastic grub and headed for New Zealand. Luckily I hooked it on my 3500 size reel with 50lb braid and a heavier drag, but he still took more than half the spool before slowing down. I got him to the boat and he took off on an 80 yard run. After that he was done and I got him to the boat. Beautiful 8lbs bonefish which Itu said is the average size down there. Amazing. After that I cast some jerkbaits around some coral and got busted off three times by trevally before heading in. Out with Mike again, looking for GTs. The wind came down and conditions were perfect. Unfortunately, luck was not on my side this day as the first three fish broke me off. I only had a couple of poppers left but fortunately I was able to stick the next two fish which were both in the 40lb range. I busted another one off and that was the morning. Those fish are so strong it never gets old seeing the huge splash when they smash the popper and then holding on while they try to pull you out of the boat. In the afternoon my wife came out and Mike took us to some snorkeling spots in the lagoon. There were tons of colorful reef fish but the highlight was the semi-tame GTs that hang out in some of the popular snorkeling spots. It was awesome to see them swimming around under water and they came right to the boat when Mike threw in some chunks of tuna. They got pretty aggressive and even bit my camera a couple times (see video below) so we got out of the water and watched them from the boat. This was the calmest day by far so I asked Mike if we could try for the wrasse. Mike had never fished for the wrasse before, but he had been broken off by some mystery fish before in some of his snapper spots and he was guessing those fish were wrasse. 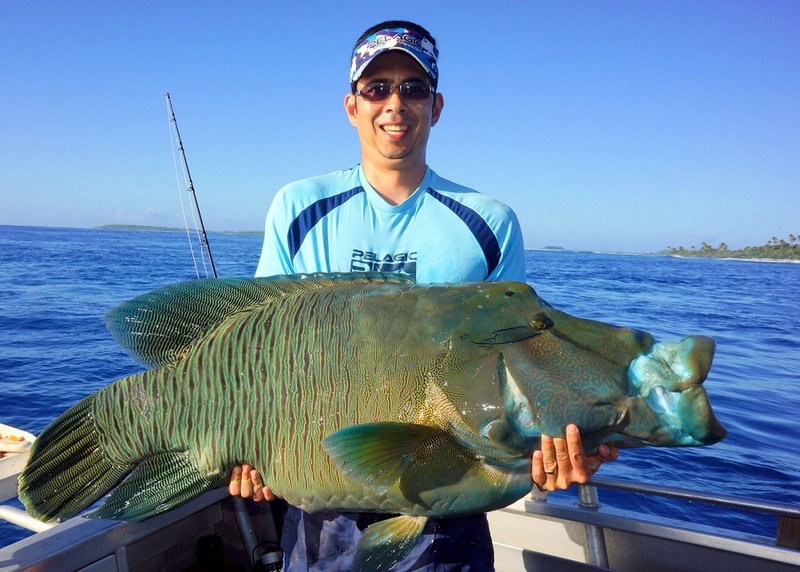 Maori or Napolean wrasse are the toughest fish to catch that I have ever encountered. They are relatively rare, and are extremely good at getting into rocks and breaking you off when hooked. Because of their size it is very tough to stop them, and because they rarely stray from the rocks they don't have to go far to rock you. I had hooked several before in Australia but never landed one. We anchored up and started chumming and Mike and his friend/deckhand started catching snapper and other fish. I was baited up with a big 9/0 hook and large chunk of tuna and I was getting cleaned out by the smaller fish. I landed a few, but mostly they just took my bait. I was very tempted to switch out to a lighter rod to catch the 3-5lb snapper but I stuck it out with the heavy outfit and was glad I did. All of a sudden my heavy rod bent almost into the water and line started ripping out. I was using a Daiwa Dogfight reel which supposedly has 66lbs of drag. I had it cranked down and line was still ripping out. I could feel the leader (130lb fluoro) rubbing on the rocks and I was waiting for it to snap at any minute but somehow it held. However, after a couple minutes of tug of war the fish got into the rocks and I could feel that I was stuck. Rather than try to horse him out, which I was sure would just rub my leader on the rocks some more, I completely slacked off and prayed that the fish would swim out the same way he went in. Amazingly that actually happened and when I saw the line start to move again I pulled as hard as I could, got his head turned, and after another tug of war session got him in the boat. That wrasse was truly a spectacular fish and certainly the craziest thing I have ever caught. I would have considered it a successful trip if that was the only fish I caught for the week, so I was really stoked. Mike was really stoked as well since he had never heard of one caught on a rod and reel before. In summary, Aitutaki is a great place. My wife loved it. The beaches are amazing (if there was even one person on a beach we would move down to the next spot), the people are friendly, and the fishing is very good. Almost no one fishes for GTs outside the reef so there is a healthy population although you have to make long casts on heavy gear to fish for them. I would definitely recommend it to anyone who likes this kind of fishing.